Misool Eco Resort, located in Southeast Raja Ampat, operates a locally manned Ranger Patrol to enforce the boundaries of the 168 sq. mile Misool Conservation Area (MCA) and the recently established second MCA for the 150 sq. miles surrounding the adjacent Daram Islands. Six years into the MCA projects, and thanks to the efforts the reefs today are bursting with an incredible diversity and abundance of marine life and even shark populations are staging a remarkable comeback after decades of ruthless shark finning. 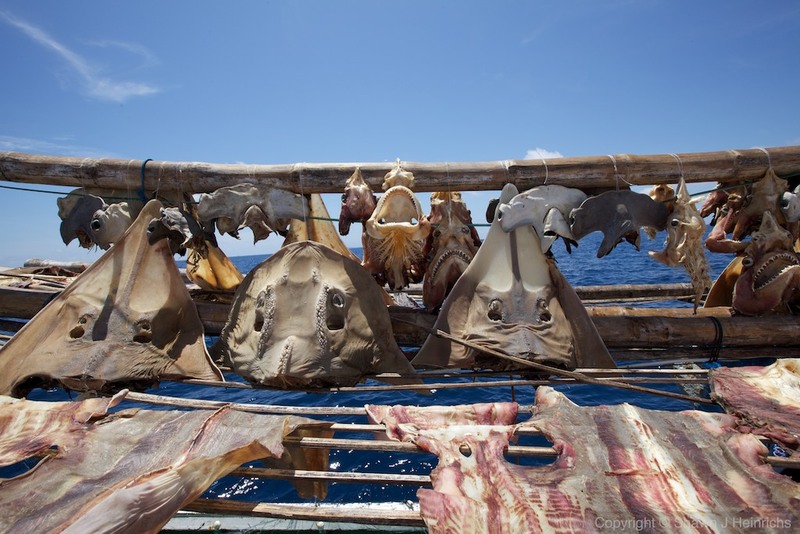 The resurgence of sharks and rays inside the two protected areas has made the corridor linking the protected areas very alluring to fishermen seeking to illegally exploit the spillover from the MCAs. This April I returned to Raja Ampat with a team of manta researchers and my investigative teammate Paul Hilton. Early one morning while in route to the manta site we observed a suspicious boat in the corridor. After radioing the Ranger Patrol we approached the boat and boarded it. On the roof of the boat, the disembodied heads of almost two-dozen scalloped hammerheads, a dozen grey reef sharks, and a dozen guitar rays and bow guitar mouth rays. 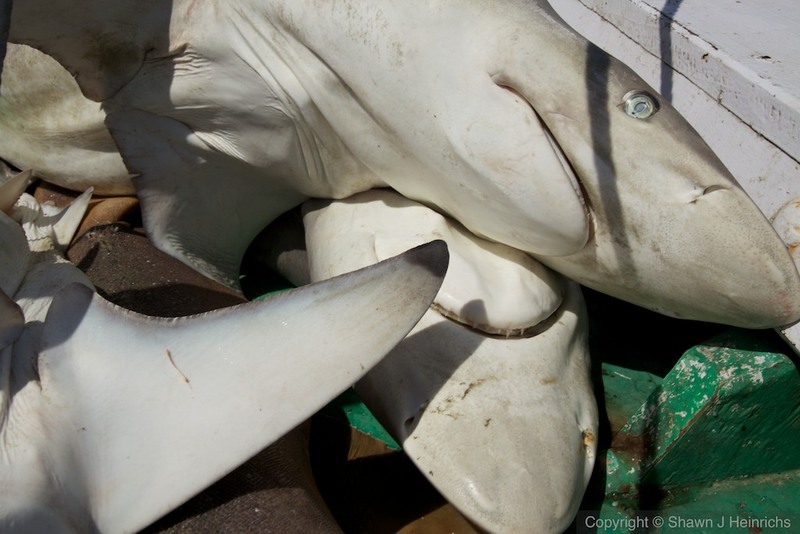 Most disturbingly, the lifeless bodies of several mature grey reef sharks and a large guitar ray lay piled on front. Our captain informed the captain of the shark boat that he was illegally fishing sharks and rays (Raja Ampat is now a Shark and Ray Sanctuary) and that he must cease and leave the area immediately. 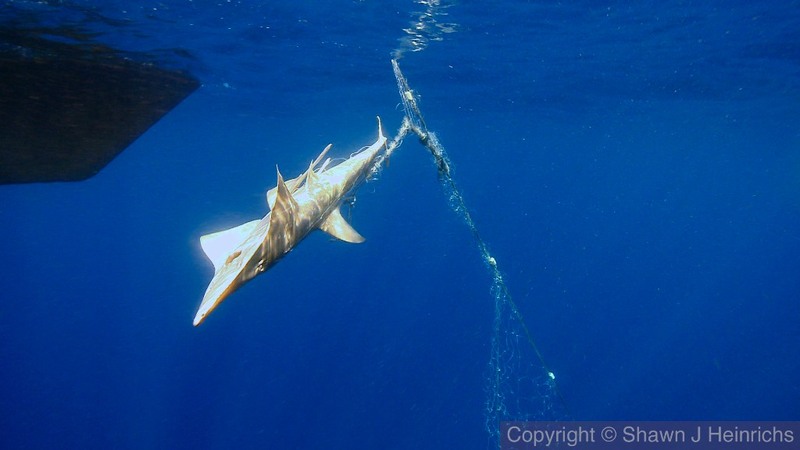 Sadly, once these nets are in the water, the damage from gill nets is unavoidable. Yard after yard of gillnet rolled up the side of the boat. 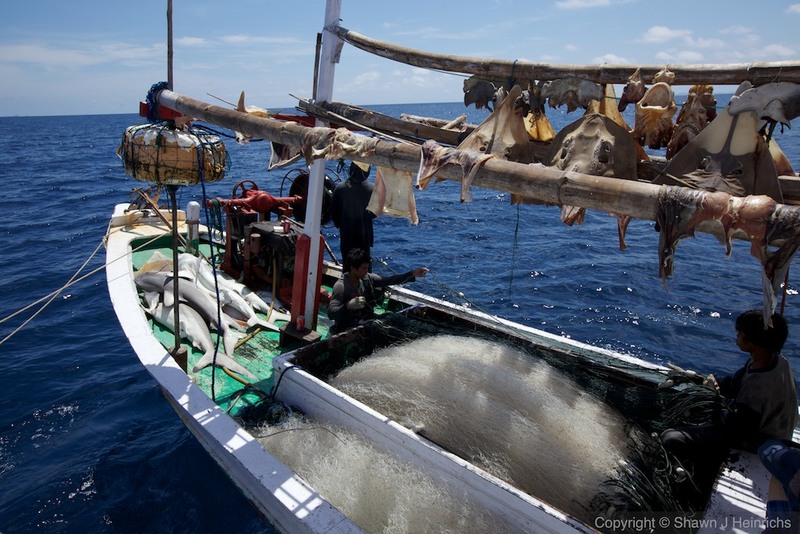 The lifeless carcass of grey reef shark broke the surface and was hoisted aboard. It was clear that this shark had struggled for a long time and had ultimately died from suffocation. 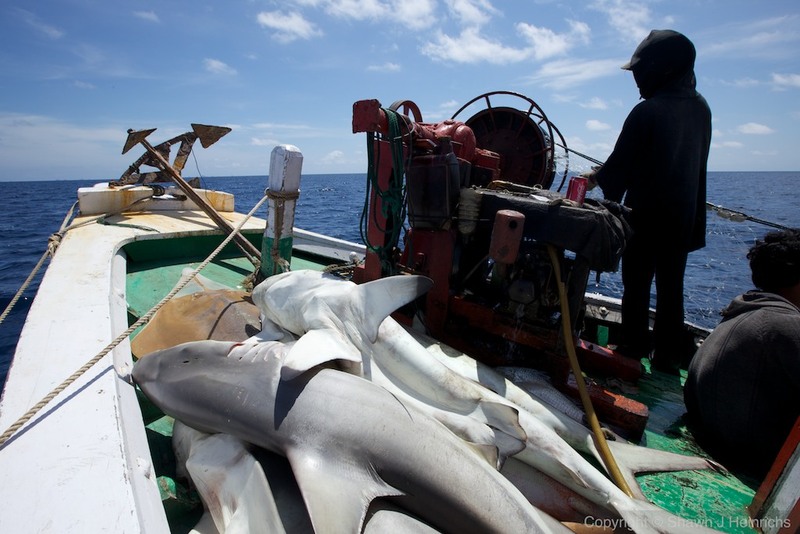 Several more lifeless reef sharks were hauled aboard and our hope of rescuing sharks turned to despair. Then the dark shape of a large guitar ray appeared and realizing it was still alive, we raced to free it. The team hoisted the massive ray aboard the boat, untangled it and released it. This rescued effort was followed by the successful release of a bow-mouth ray, another guitar ray, a wobbegong shark, and a pelagic stingray or two. All in all, we freed and released half a dozen live animals. Our ranger boat arrived and took over the enforcement effort. Recognizing our work was finished; we untied from the fishing boat and pulled away. As I took stock of all day’s events, I was reminded that conservation is much more than a stand-alone victory, more than a one-time culmination of effort and intention. Effective conservation is a lifetime commitment requiring constant care and vigilance. To believe otherwise is to not only court disillusionment and failure, but also to imperil our most treasured resources. 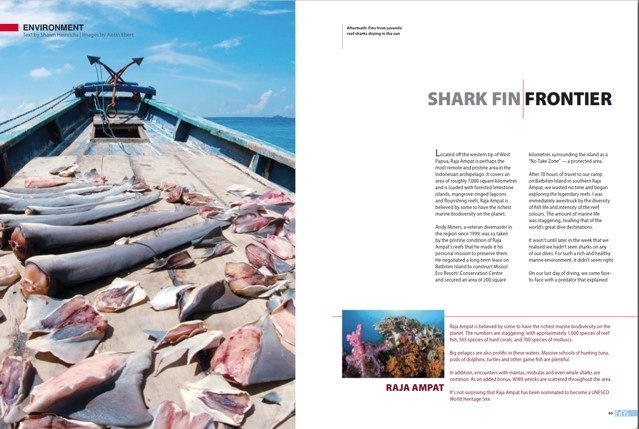 The following is a printed account in the July issue of Fins Magazine of our encounter with a shark finning crew during our visit. This is a more condensed version of the story told in April’s issue of Asian Geographic. Please share this with others so they might be motivated to take action as well.